Purchased by Bill Foley in 2016 and rebranded to Foley Sonoma, Foley Sonoma wines mix old-world tradition and modern technology to allow for gentler handling of both fruit and wine. 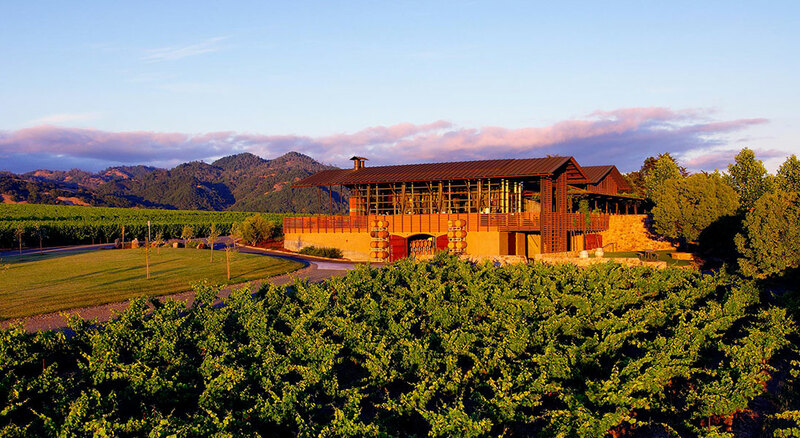 Nestled on a gentle knoll shadowed by the nearby Mayacamas Mountains, the site of Foley Sonoma typifies the peaceful, serene beauty of the Alexander Valley in the world-renowned Sonoma County, just eighty miles north of the Golden Gate Bridge. Previously Stryker Sonoma, the vision and creativity are inspired by the vineyards and countryside surrounding the Estate. Our winemaking philosophy is about pure varietal expression which produces award-winning, balanced wines rich in fruit and deep in character. The Vineyards produce 4,000 to 6,000 cases annually from the following varietals: Cabernet Sauvignon, Cabernet Franc, Chardonnay, Malbec, Merlot, Petit Verdot, Sangiovese, Sémillon, Tannat, and Zinfandel. Guests visiting the winery today can watch the winemaking process in action, viewing barrels as they are racked in the aging cellar and step onto the observation deck to see how grapes enter the crush pad for sorting and de-stemming. Designed by Nielsen Schuh Architects, the inspiration was to create buildings that are aesthetically beautiful, sensitive to the environment and in harmony with the landscape. The state of the art modern facility was specifically designed to create small lots of ultra-premium luxury wines from the Estate Vineyard. The building won the Architectural Design Award for Northern California by AIA. Ever since, the Tasting Room has been open to the public daily 10:30 to 5:00 p.m. and is focused on extending a wine country experience that is truly “Quintessential Alexander Valley”. We are few, so to ensure quality we make wine in small amounts from our estate. We enjoy diversity, so we make our wines from a number of varieties. We embrace life, so we share our love of living with those who join us either for a day or for a lifetime. Our philosophy is reflected in the design of our winery and approach to winemaking. Bold but thoughtful. A blend of traditional and modern. Efficient, but lively and spirited. Our wines, we hope, embody our hard work, attention to detail and the joy we take in making them. We are all a bit free-spirited by nature. Conventional rules, devoid of understanding or heart, hold no appeal for us. Guided by youthful enthusiasm and tireless dedication, we produce balanced wines high in quality, rich in fruit, and deep in character.